These snap bands can have the printing of your choice and are an ideal promotional product. The minimum order for printing is 300 pieces. This quantity printed with just one colour costs £444.00 plus VAT and delivery. Larger quantities can reduce the price dramatically. 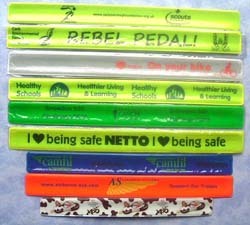 These snap bands can be printed with several colours, please contact for a quote. The lead time can be as little as 10 working days. We will soon be adding an ordering facility to this page but for now please either phone through your order on 01782 626829 or send it via email. These plain colours are available from stock for less than 300 pieces.